"This is a thrilling time to join Florida Atlantic University," said Hallstrom. "The university is on an amazing trajectory, driven by capabilities and opportunities that span every college, at every campus. There is incredible capacity to build interdisciplinary teams here, teams that are going to have a fundamental impact on the state and the nation." Hallstrom, a professor in FAU's College of Engineering and Computer Science, will serve as director of the Institute for Sensing and Embedded Network Systems Engineering at FAU (ISENSE@FAU). ISENSE will serve as an interdisciplinary research hub, drawing talent from both within and outside FAU to tackle grand challenge problems head-on through novel hardware, software and ideas. "Florida Atlantic University has a unique opportunity to become a clearinghouse for streaming data, to drive big data and data analytics, and to become a major applier of these data streams to fuel research," said FAU President John Kelly. "Jason is an outstanding addition to our University and his cutting-edge research will bring significant benefits to our state and its citizens." Hallstrom is already exploring joint projects with FAU's Southeast National Marine Renewable Energy Center, Harbor Branch Oceanographic Institute and Charles E. Schmidt College of Medicine. These collaborations will produce new technologies, new ideas and new discoveries that will benefit Florida and its citizens. "ISENSE@FAU will truly exemplify how interdisciplinary research can bring together faculty, students and staff from across disciplines and campuses to solve complex problems that impact us globally," said Daniel C. Flynn, Ph.D., vice president for research at FAU, who will oversee the Institute. 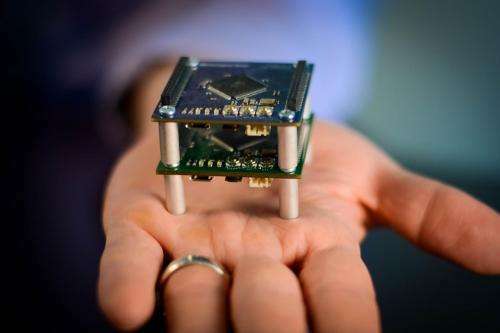 Hallstrom's research is supported by awards from the National Science Foundation, and he is working on the next generation of his water monitoring device, aptly named "Eiffel" to illustrate how this unique device can capture a birds-eye-view of Florida and beyond. "Applied sensing and the emerging 'Internet of Things' provide endless possibilities for making the 'invisible' visible, both in the small and in the large," said Hallstrom. "At FAU, we will be developing technologies for a broad spectrum of applications and uses, ranging from monitoring physiological changes in senior patients to support aging in place, to mitigating natural and manmade disasters, such as hurricanes and biological threats." Sensor networks enable applications in monitoring wildfire conditions, locating sniper fire and assessing the structural integrity of buildings and roads. In the event of a manmade or natural disaster, these "sensing fabrics" can be used to provide near instantaneous feedback on the type, degree and location of damage. Emergency management decisions can then be optimized to quickly commit personnel and resources to where they are needed most. Prior to joining FAU, Hallstrom was associate professor in the Computer Science Division of the School of Computing at Clemson University and served as deputy director and director of technology for Clemson's Institute of Computational Ecology. Hallstrom spent more than a decade at Clemson and was an integral member of the university-wide research team of river and wetland ecologists, computer engineers, software developers and forestry and natural resource scientists who created an information web to monitor, analyze and report the health of the Savannah River Basin. Clemson's Intelligent River enterprise operates a hydrological observation program that provides real-time monitoring, analysis and management of water resources throughout South Carolina. In his new position at FAU, Hallstrom will continue to lead the technology development efforts for the Intelligent River program.